This dessert is a hit with everyone and does not require turning on your oven. It is yummy! Combine juice, water and pinch of sea salt in a medium saucepan and bring to a boil. Add the couscous. Stir quickly then immediately remove from heat and cover. Let sit for 10 minutes. Scoop the cooked couscous into a square baking dish (8 or 9 inch). Press couscous slightly and even out the top. Set this aside. Optional Modifications: If you are gluten free, substitute millet or polenta for the couscous and change the ratio of grain to liquid from 1:2 to 1:3. Cooking time will slightly increase to 20 minutes for millet and 5 for polenta. Combine juice and water in a saucepan. Add the agar agar and a pinch of salt. Turn the burner on and slowly bring the liquid to a boil, stirring frequently to allow the agar to dissolve. IMPORTANT: If you do not stir often enough the agar will clump. Once it comes to a boil, let it boil for about 2 minutes while continuing to stir. Remove from heat, add brown rice syrup and fruit. Set the topping aside and allow it to begin cooling. The topping will begin to thicken. Just as it starts to thicken, pour it on top of the couscous and spread evenly. Let it sit for an hour on the counter or in the refrigerator so it firms up. Enjoy! Note: If using frozen berries thaw them first in a small saucepan over gentle heat, strain the fruit out, and gently reduce the liquid to about 3 or 4 tablespoons. 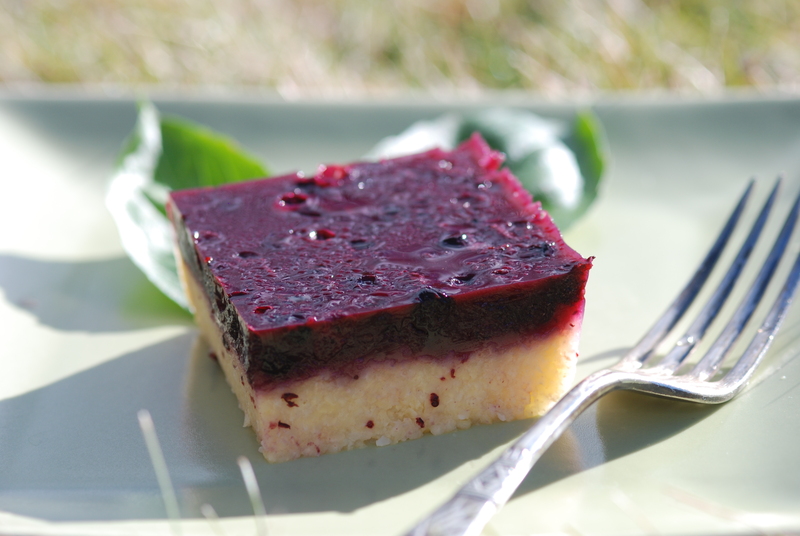 Frozen blueberries are great in this recipe because the set very well due to the high amount of natural pectin in them.